Discussion in 'Apple iPad News' started by iDan, Jan 28, 2010. P.A. Semi (originally "Palo Alto Semiconductor") was a fabless semiconductor company founded in Santa Clara, California in 2003 by Daniel W. Dobberpuhl (B.S. EE 1967 University of Illinois, Urbana-Champaign) who was the lead designer for the DEC Alpha 21064 and StrongARM processors. The company employed a 150-person engineering team which included people who have previously worked on processors like Itanium, Opteron and UltraSPARC. Apple Inc acquired P.A. Semi for $278 million in April 2008. The system on a chip combines the CPU with an integrated graphics processing unit as well as other parts. The main processor is an ARM Cortex-A9 MPCore. The graphics processor design is likely to be a PowerVR SGX series 5 (the SGX545) core, plus a PowerVR VXD for video and audio playback, licensed from Imagination Technologies, which confirmed Apple was a licensee on 18th December 2009. The A4 is capable of running OpenGL ES 2.x applications and possibly OpenGL 3.2 and OpenCL 1.0 applications. 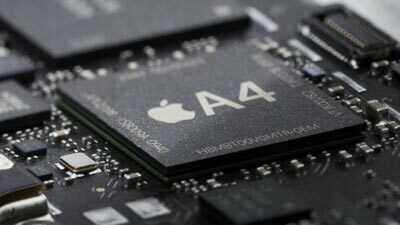 The A4 processor is much faster then the current iPhone 3GS running at 600Mhz and iPod Touch. Speed isn't everything when designing a mobile chip though, power consumption is just as important. "The A4 chip is so power efficient that it helps iPad get up to 10 hours of battery life," according to Apple's iPad Web page.